[Risk No. 20] Ask God to bring you to someone who needs to be invited into relationship with him. Be aware and be ready to share the Gospel. [Risks No. 936 – 944] Part two of the 33 Risk journey in Nashville was at the Cool Springs mall again. I brought my nine-year-old son and met our friend Jeremy. I have to admit it’s been a bit disheartening that out of several hundred who watched the Colombia Documentary (and where I shared this 33 Risk Challenge idea) only one (beside my son) has joined me. The first temptation the devil throws at me is to let offense set in and to begin laying blame at what I’m NOT seeing. The first reminder that God, my Father, brings me is that His dearly beloved Son took every offense so I didn’t have to. I released my expectations and my disappointment to the Lord and thanked Him for all of those who I’ve met – here in Nashville and beyond – who are stepping out in loving faith all the time. There’s no room in life to live offended – regardless of how justifiable an offense might be. Live love and trust Jesus to accomplish the rest. We followed-up with several friends we had made the week prior which was really sweet. Just to say hello, encourage them, and remind them they’re loved. I noticed Zack walking towards me (with a walker and his family). I asked what had happened as he didn’t look like the kind of person who needed a walker. He said he had broken his back and is slowly recovering. Asked if I could pray for a speeding up of that process. “Sure.” His family paused while I gently placed my hand on his back and prayed. Asked if there was any pain. “Thankfully, no.” Encouraged him and blessed him. Noelia was working at the same booth where we had met Greg the week prior. Asked her how we could pray and at first she couldn’t think of anything and then it was like a light-bulb went off. “Oh! I get these weird anxiety attacks sometimes especially when I’m studying for big exams or finals.” We talked about what those felt like and held hands together rebuking anxiety/fear/stress/etc. Shared encouraging, prophetic words over her life and what God was calling her into as a daughter (she was a believer). Super encouraging. Jonathan was working at the toy store counter. We asked how we could pray. He was awkward and I could tell he wasn’t sure how to respond. I asked about pain. None. Asked if we could simply bless him. “Um, Ok.” Offered my hand and prayed a blessing over his life – that he would fall more in love with Jesus and grow into a world-changer, all the days of his life. Robbie was flying the Helicopter when we began making small talk. Turns out he moved here from Israel and is Jewish. Super cool to talk with him about our Jewish Jesus and why we follow him. Prayed over him and shared how much the Father loved him and invited Jesus to continue making His presence known to him. Great conversation/prayer-time. Nick (Vipul), was a Hindu man from India selling cell phone cases at a kiosk in the mall. We approached and began talking. Asked how we could pray. He gave us the funniest look ever. So classic. He and his family had moved here a month ago. I asked about pain and he quickly pointed out his calf bothers him all the time, but especially in cold weather. I told him I believed Jesus had sent us to him to bring healing to his body and to encourage his heart. We prayed and instructed him to walk around a bit to test his leg. He came with a puzzled look on his face. “There’s no pain.” No pain at all? “No.” Jesus did that! We continued to share God’s love and I shared how I used to really deal with anger issues. He shared that he dealt with the same. We prayed and rebuked anger. Shared the Gospel, invited him to church and gave him my contact info. Lord, thank you for the openness in this man’s heart. Would you continue bringing people his way that would point him to You? We asked Megan if she was dealing with lower back issues. “No, but my husband and another employee is.” Neither were at the mall so we asked if we could pray for them with her. She agreed. Held hands and prayed for a rebuilding of backs, muscles, bones, discs and spine. Spent a good amount of time praying over her and encouraging her. Met a mother and son duo that moved here from Arkansas and worked together. Prayed for/encouraged each separately but I unfortunately can’t recall their names. Slightly awkward, still awesome. Asked another couple if we could pray for them, shared that God had high-lighted them, but they shared they were doing OK. I should have stepped out an extra step prophetically but I didn’t. God is love and I’m His. Thank You, God, for growing me past the awkward. Several people that I noticed but didn’t pray for, either because we were already engaged in conversation or I just didn’t go for it. Thank You, Jesus. Thank You for watering the seeds continually that were planted last night and that are being planted, even now, the world over. You are amazing. Draw us into Your heart all the days of our lives. Amen. 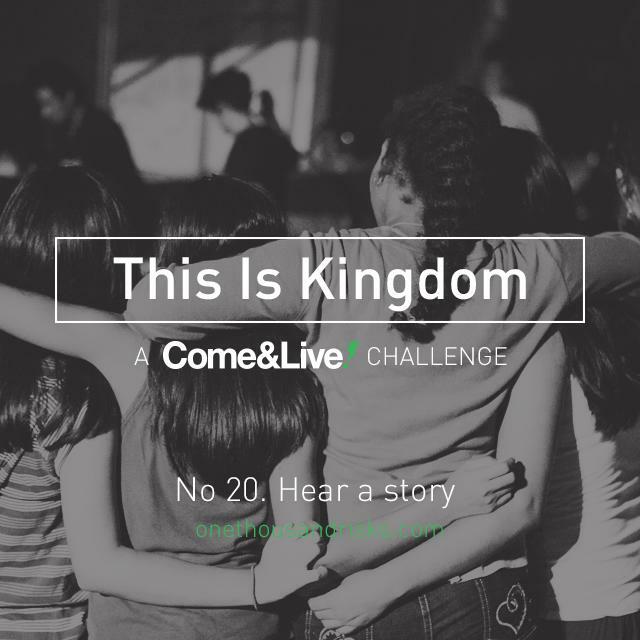 This entry was posted in Awkward, but learning!, Encouraging, Feature Risk, Friends, Healing (physical), Hugs, Prayer, Prophetic words, Rejected, Risks, This Is Kingdom: 33 Risks. Bookmark the permalink. ← Risk No. 19 + Screaming Boy. I pray that you are not discouraged. I am a homeschooling mom and don’t go out and about much, but I’m asking Jesus to make it count when I do. I slowly let a lot of “no’s” discourage me in the late summer/fall, to where I didn’t even bother asking anymore. It wasn’t always a conscious choice. Sometimes, yes. Praise Jesus for grace upon grace. You’re not alone. God is good, doing good things. Lord, bring your encouragement.